Carteret RV, in partnership with Busy Bee Service Company, handles major and minor repairs for your Recreational Vehicle or Park Model Home. You can request service online! Just complete the form below and one of one of our associates will contact you soon to schedule an appointment! We offer major floor and side wall repairs as well as rubber roof replacement. We can replace your damaged roof and/or repair any structural damage associated with roof damage. Let us “remodel” your existing unit if you aren’t ready to purchase a new trailer or park model. All insurance and major damage repairs are welcome. Carteret RV & Busy Bee Service Company are fully insured AS REQUIRED BY THE AREA CAMPGROUNDS! We provide a variety of guaranteed RV services to maximize your destination trailer, travel trailer, fifth wheel, park model or motor home enjoyment. 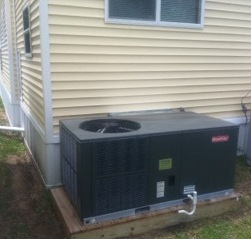 Goodman HVAC system installed with New Park Model Home on lot! • HVAC – We are fully licensed for new system installation or repair. • Carpentry – We handle an array of services large and small. • Electrical – We are licensed for all residential/RV electrical needs. • Plumbing repairs – Let us take on the hassle for you!